Still. | Gentle. | Powerful. Abundant Yoga is a Christian yoga studio located in Franklin, TN, just a few minutes south of Nashville. While “Christian yoga” might sound like an oxymoron, you are encouraged to read further! We provide a complete experience of union with God our Creator through meditation that is still, movement that is gentle, and postures that are powerful. Abundant Yoga is proud to be a MindBody Visionary, as well as a partner with these businesses and organizations. Hear from our clients about their experiences with Abundant Yoga. "Being stretched spiritually and physically is a great joy at Abundant Yoga. All the instructors are most welcoming and encouraging. As one of the "older" folks participating, I can honestly say that over time and due to their instruction and encouragement, I have gotten stronger." "My wife and I are totally new to yoga, but the classes we have taken at Abundant Yoga have been absolutely fantastic! The instructors are very gifted and are always willing to help beginners like us with learning how to do the poses. We are hooked!" "I love the fact that this studio is Christ-centered. The teachers are warm and welcoming, and the teaching itself is great. I'm a beginner and the teachers are really helpful in making sure I'm doing them right and being supportive and encouraging as I go along." "I visited Abundant Yoga for my very first yoga class. It was great! It was a gentle/power flow. The instructor was great, and I didn't feel out of place or inexperienced. It's such a warm, welcoming environment. And to top it off with the powerful word of God...perfect! Yoga Church on Sundays is exactly what you need to jump start your week! Love!!" "What an awesome experience!! I had very little experience with yoga. The class began with a meditation, much like what you would read in a morning devotion. The pace of the class was perfect. I never felt out of place or uncomfortable. The next day, I could feel muscles in my body that I've never felt before. This class would have your body in beautiful shape in no time!" "This was a fantastic experience. My wife has been to some classes before and did a retreat once with AY. She has been trying to get me to come ever since. Here at AY, they tend to spirit, mind, and body, and it is so refreshing. I left feeling rejuvenated and encouraged. These folks are set apart from the rest with their approach to bringing Christ into the very center of what they do." Whether a first-timer or an experienced yogi, we offer Christ-centered yoga through our classes, workshops, retreats, teacher trainings, events, personal sessions, and more. 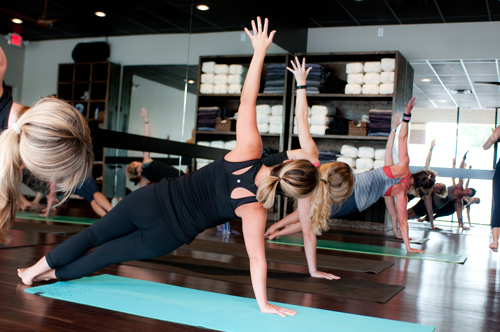 Make yoga a part of your daily routine with our schedule of weekly classes! Explore all that Abundant Yoga has to offer in our workshops and retreats. We want you to feel at home in our studio. Come with a willing heart and willing body! Yoga is a practice, and with anything new, growth comes with practice. TSY is a yoga centered class that is targeted towards teaching survivors of trauma to reconnect to their breath, bodies and brain in a safe, calm environment. A practice uniquely designed for pregnancy, Prenatal Yoga is a form of yoga that helps support moms-to-be emotionally and physically. Our weekly Donation Class is a class open to anyone wanting to practice and worship with us! Read more about why we began our donation classes. We think yoga can actually benefit men even more than women! Our studio strives to create a space and environment that welcomes all levels and ages of “men on the mat”. Just as the adult classes at Abundant Yoga seek to create a still, gentle, and powerful union to Christ through the modality of yoga, so do our kids classes/workshops! The science, heart, and artistry behind our method here at Abundant Yoga. Take a look at our current pricing and specials. The team that makes Abundant Yoga flow. Keeping our fellow yogis in the know with what’s going on at Abundant Yoga. Send us a message, give us a call, or stop by the studio. We love to hear from our fellow yogis. Your message is always welcome! Need help finding our location? We are located in the Camden Commons retail area, right behind Sopapilla’s in Franklin (at the intersection of Moores Lane and Franklin Road).